Whenever I go somewhere and they have soft pretzels I always want one. I love them, a lot. They're soft inside with the crunchy exterior and a little salty, yum. These pretzels are delicious. My favorite is the one covered in chopped candied almonds and dipped in honey. I could have done it with all eight but I thought better of it because then I would have eaten all eight. Gently warmed up honey would be awesome with these but we didn't bother and they were still great. The only complaint is that these could be a little crunchier on the outside but when you eat them immediately they do have a slight firmness to the outside that is lovely with the soft interior. I'm not really complaining though because I'm sure I will make these again, and next time they will all have almonds on them :). Happy Baking! 1. Place all dough ingredients in a large bowl or the bowl of a stand mixer with dough hook attached. 2. Knead by hand or mixer five minutes or until a soft and smooth dough forms. The dough will not be sticky to the touch but may stick to the bowl a bit. 3. Sprinkle dough with flour, cover and let rise 30-45 minutes. 4. Preheat oven to 475° F. Lightly grease two baking sheets or line with parchment. 5. Divide the dough into 8 pieces. Add the baking soda to the boiling water, stirring vigorously to dissolve; allow water to cool to lukewarm as you shape the pretzels. 6. 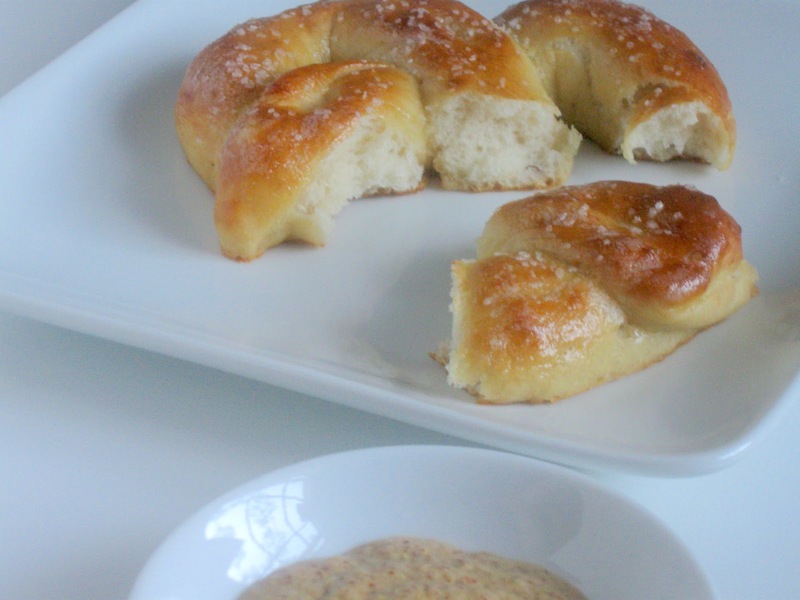 Roll each piece of dough into a long, thin rope (about 18-20″), bring ends around and cross the center of the rope and drape tails into a pretzel shape. 7. Pour cooled baking soda wash into a 9×9 square baking pan. Place the pretzels, two at a time, into the water and soak for 2 minutes. Transfer to baking sheet. 8. 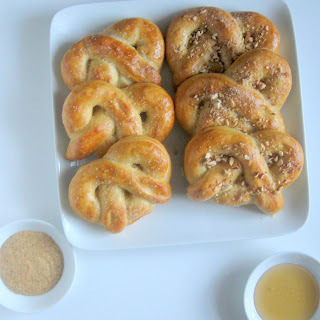 Bake pretzels for 8-9 minutes or until golden brown, rotating baking sheet in oven halfway through. 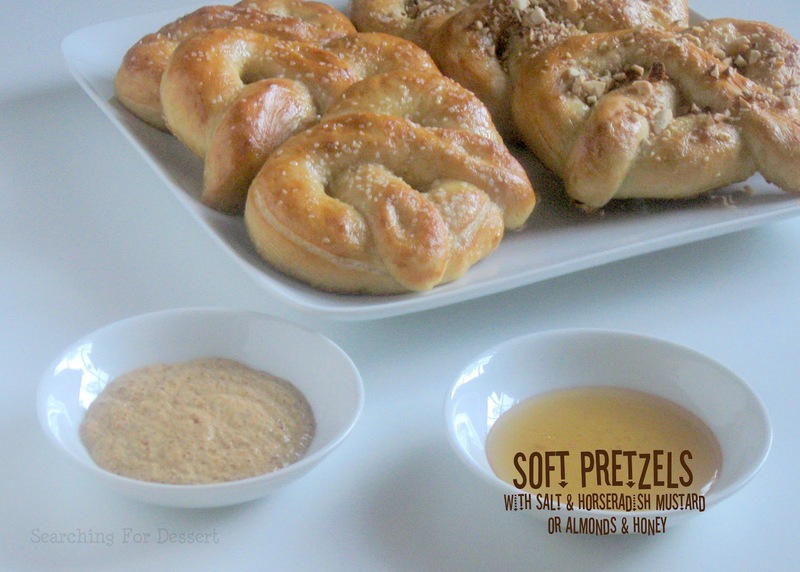 Remove from oven, brush with melted butter and sprinkle with salt or candied almonds. Dip in mustard or honey. Serve immediately.